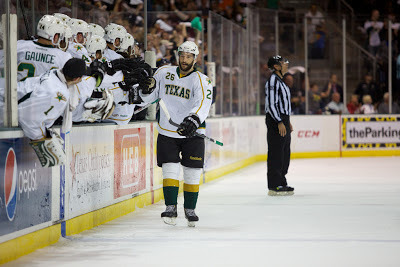 After a deflating loss on Thursday, the Texas Stars got back to playing their game with a 2-1 win tonight in Cedar Park to even the series at one a piece. "Thursday we were puck watching," said forward Alex Chiasson. "[Tonight] it was our tempo, our game. It was a solid team effort." "I thought we battled harder tonight than [Thursday]," added Coach Desjardins. The Stars led 2-0 up until the final two minutes of the third as it took a 6-on-5 effort to penetrate the Stars' defenses and get one past Cristopher Nilstorp. "We limited their chances to perimeter shots," said defenseman Joe Morrow, who scored the game winner. "They make D men pay a price. They hit hard, and they hit often." Even with this game having the same score as the last, it seemed that there was even less time and space for both teams tonight. Plays were getting broken up and there wasn't a lot of room to move out there. "Every inch you can take is one you'll need," said Chiasson. "These 2-1 games are tight games." Cristopher Nilstorp was phenomenal again, especially during Oklahoma City's four power plays. He stopped 27 of 28 on the night. The Stars jumped out to the lead late in the first period. Justin Dowling put a relentless forecheck on the Barons' defense, forcing a turnover. "We try to establish a forecheck, but their D are great with the puck," said Coach Desjardins. "[Dowling] made a great play to jump up." Dowling slid the puck to Jamie Oleksiak at the right point and the ensuing Oleksiak shot was tipped past Danis by Mike Hedden for the 1-0 lead. Texas got into penalty trouble as the period ended and had to kill a 5-on-3, which they did successfully. "[The kill] gave us a lot of momentum," added Morrow. Morrow would pot his first pro playoff goal in the second period on the power play. "I came off the bench and had a little bit of speed coming into the zone. I got a nice pass [from Connauton], and it was a great screen by Chiasson." He continued, "Coach is always telling me to shoot the puck so I shot the puck. It was definitely one of the 'seeing-eye' shots." That seeing-eye shot found the top right corner for the 2-0 lead after forty minutes. The Barons came to play in the third period but still could not solve Nilstorp until the pulled Danis for the extra skater. Mark Arcobello scored his fifth of the playoffs with 1:55 left to put every Stars' fan in attendance on the edge of their seat. The game ended rather anticlimactically as Jonathan Cheechoo took an interference call and forced the faceoff to his own zone with six seconds left. With this effort, Texas moves the series to Oklahoma City where they must play at least three games over the next week. "We came out strong and played a full sixty," said Morrow. "We do play well on the road so we're looking forward to the next few games." Game 3 is on Monday. How has your attendance been during the playoffs?